Designing library spaces for users today means embedding digital services in physical spaces and creating interactive, engaging library services. In this second of two articles commissioned by Designing Libraries, Kate Lomax of Artefacto looks at the implications for a library’s physical spaces of the growth of digital collections and digital information, and the changes in the way users communicate and access information. Despite the fact that libraries now provide many different digital services alongside the physical library services, digital services are often underrepresented, if not invisible, in the physical space of the library. There tends to be a clear line drawn between ‘at the library’ and ‘on the web’. But this distinction doesn’t really reflect the reality of the modern, hybrid library where users interact with library services in a number of ways inside and outside the physical library space. Nor does it reflect the realities or expectations of library users who interact with smart devices and other new technologies on a day-to-day basis. The very same creative technologies (and ethos) that have made makerspaces such an exciting addition to the library repertoire also have the potential to help create new ways for users to engage with library spaces. New, interactive technologies provide a range of opportunities for libraries to connect with users and to bring the digital and physical services of libraries together. These are tools to help reduce friction between services, to solve problems quickly and emphatically, and to make users’ lives a little bit easier. They can also help reintroduce features of library spaces (such as serendipitous discovery, curation and access to subject matter experts) that are often left on the shelf when it comes to digital services. Let’s look at just a few opportunities to add interaction to library spaces. Conversational interfaces are available to us in a number of ways, from chatbots and social media to voice interaction. Chat is a great way to have conversations with users no matter how or where they are interacting with your services. These can be great, easily-accessible support tools for online services as well as a friendly and empathetic way to provide support to users when in the library (ready and available when needed). Chatbots are a way to provide an automated, machine-learning-powered chat service. Like all new technologies there are good and bad implementations of chatbots. Good implementations tend to be empathetic and human (even when they’re technically not). The ABC NewsBot is an oft-cited example of a great , well-implemented chatbot - a service that has been providing news updates, alerts and more via Facebook Messenger and Twitter since 2016. Voice interfaces also provide potential new ways for users to engage with digital services in physical spaces. As smart assistants such as Siri, Google Home and Amazon Alexa become mainstream, our users become more familiar with interacting with voice user interfaces (VUI). Like voice user interface design, augmented reality (AR) is in its infancy and new approaches are emerging all the time. But the combination of digital information overlays in physical locations provides huge potential for providing contextual services and support. Artivive, a platform for artists utilising AR is an example of how new, augmented experiences are being delivered in museum and gallery spaces – and it demonstrates the potential of AR for delivering engaging, story-based experiences in other public spaces. And it’s not the dedicated platforms and specialist apps that are exciting about Augmented (and Virtual) Reality, but the tools emerging that make these experiences available directly via the browser, such as WebAR. Touch screens are another low-barrier way to engage users in different ways. 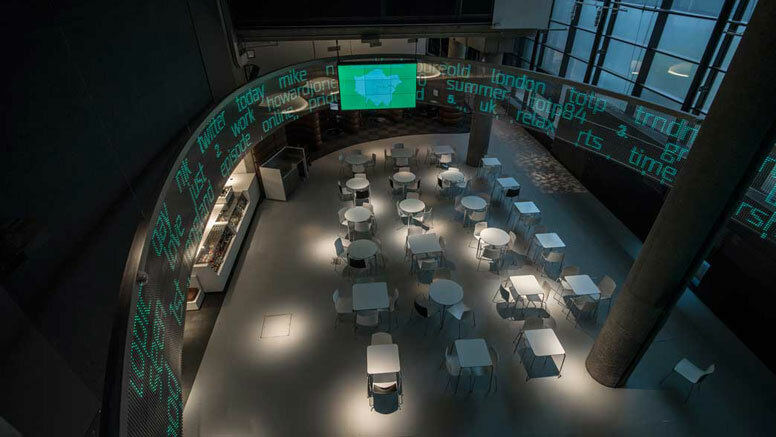 Rather than passive digital signage, these can become interactive displays for people to engage with. You can roll your own or work with digital display vendors to provide next-level user feedback kiosks, digital signage and data display walls. DLib Wall at the University of Nevada, Las Vegas Libraries combines six 42-inch touch displays to create a massive display for users to interact with the library’s digital collections. The Twitter wall at the Museum of London, a geotagged real-time analysis of tweets in London, is a good example of an engaging, user-driven display. And thanks to affordable computing devices such as the Raspberry Pi, you can now create your own digital display solutions, controlling and customising the information you make available to users and turning any surfaces into interactive ones. Don't be afraid to raid your local makerspace to get started prototyping new kinds of interactivity in the library. These examples demonstrate you can design human-centred digital interactions that can connect users and help reduce friction between services in a fragmented, hybrid library world. Not all experiments and interactions will provide permanent touchpoints for the library, but they can provide new avenues for users to discover and explore library collections and new ways to engage users in the design of library services and the physical spaces that define them. ABC News (Australia) announces its newsbot service. Bringing art to life with Augmented Reality. DLib Wall is one of the first applications of its kind, and demonstrates several relatively unexplored interaction modalities. Pulse, a new installation at the Museum of London, tracks social media live to see what Londoners are thinking and tweeting about.